This season has been a fun winter to experience, and it epitomizes why I live in Oregon. 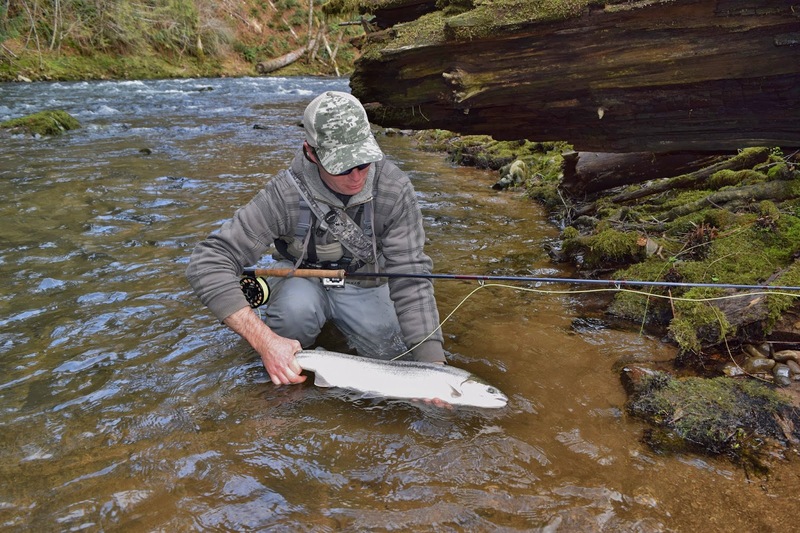 Winters when the steelhead runs are robust are really enjoyable because you can get stoked during the time when most people are dreaming of the summer, and you can also learn to appreciate the seasons even more. 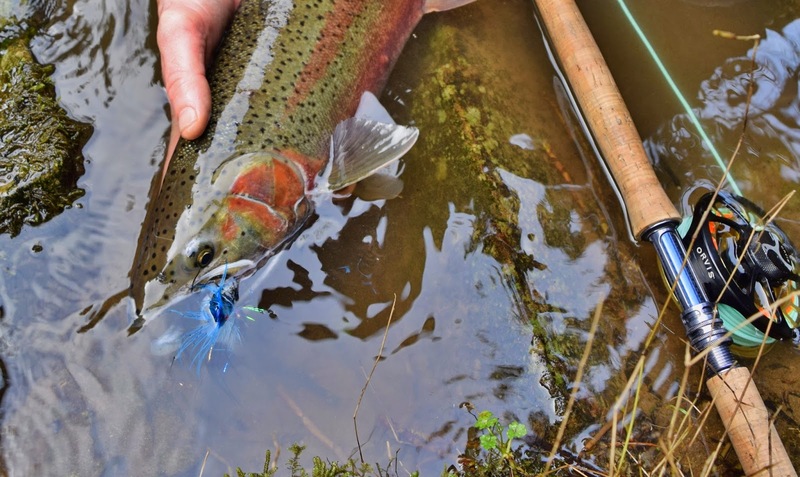 I have been fishing long enough for winter steelhead where you see the subtle things happen like the new shoots popping out of the ground of stinging nettles in February, and that tells you spring is around the corner. You see the early mayflies, and once in a while a cutthroat slurping one on a warmer calm cloudy day. The moss carpets anywhere it can cling onto, and its green starts to become much brighter than that of the earlier part of the winter. The other day there were so many of this one type of mushroom all over the place, and three days later there was not one to be seen. Conversely, weeks back, and even a few weeks ago you could smell the partial remnants of decaying salmon far from the rivers where animals dragged the fish into the woods. A fishing session nowadays doesn't pass without some major raptor; whether it be a bald eagle or some type of a hawk swooshing down through whatever river valley I have been visiting for the given day. Sometimes you look down and see a perfect little disc rock. This bug hooked up with a fish that went totally bonkers before heading over a falls. Signs of how high the water was on the very last high water event. This rough skinned newt was quite entertaining to observe. The deformed right front hand made me wonder what all of the possible reasons would be.....? Amphibians are the true tell tail responders to things being messed up in the environment. With all of the beautiful water and amazing green mossy forests out there, things are hidden right in front of our eyes. From here down are pictures from this past Valentine's Day. I was lucky and got to go fishing with my wife Nikki. We more or less had the river to ourselves minus seeing a couple we know that were leaving when we arrived. Later we saw another two people I know, but we didn't interfere with each others water anyhow. Gorgeous weather and good fishing! Fish on the swing in the first spot of the day we decided to fish! This colored up buck decided to chomp on the black and blue swung wet. Fish on and pulling hard in very heavy water. It seems like it is going to be a really nice steelhead. Every time I could budge it into the shallows, it would sprint back off into the mysterious green depths. This winter steelhead is a gorgeous two toned chromer ! They don't get much brighter than this! How much joy it was to spend time with you, but you must go back and complete your mission. The little tributary picture was taken by my wife Nikki - she's got skills! Focusing hard on the presentation after the cast for those elusive steelhead. The anchor is releasing from the water in this pic. Good timing on the pic Niki! Nikki has great photography skills, and in this pic she caught the line in the air all the way across. Nikki was playing around with some of the filter functions, and this one looked nice and green!